But the reliance on guns and hoses has dipped a bit in the past couple of years, as power tool manufacturers have introduced a new generation of battery-operated cordless nail guns. There are even some models now that are powerful enough for framing work. However, you still have to plug them in to charge, and on many jobsites that brings woodworkers back to hauling – this time, it’s a generator instead of a compressor. Yes, there are some innovative solutions such as solar charging, but for installers who prefer the efficient, satisfying plunk of a real pneumatic gun, there’s another way to go: portable high-pressure storage. This comes in the form of small, extremely portable tanks that can store compacted air at a very high rate of compression. For example, Komptec Air Systems (komptec.com) in Pleasanton, Calif., has been carrying the German-built Turanair system for the last year or so, which it sells through a network of regional distributors. 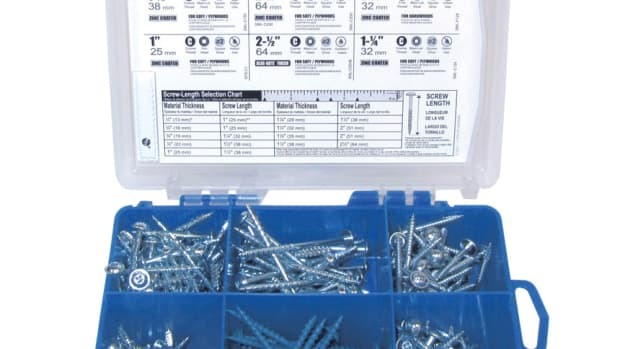 The device connects to most standard air tools with a quick-release coupling. 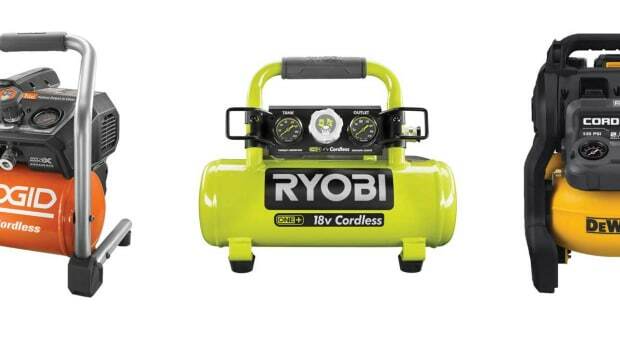 The company’s popular 114 cubic inch cylinder, filled to 4,500 psi (and regulated to 150 psi or lower by a two-stage regulator) will permit hours of operation for single-shot air tools such as nail guns, staplers and caulking guns. Then it can be refilled at the end of the day by a high-pressure air (HPA) compressor. The whole assembly only weighs about 14 lbs. and sells for $945. The decibel level in many compressors has been significantly reduced over the last few years. A good example is the Light & Quiet compressor, model CAT-1P1060S, from California Air Tools (californiaairtools.com). It runs at just 56 decibels, which is less than the noise level of a normal conversation, and despite its miniature size (it’s only 29 lbs.) the unit packs a decent punch with its large piston and oil-free design. It produces 1.2 cfm at 90 psi, and 1.6 cfm at 40 psi, so it will run most finish nail guns. One way the company has reduced the noise level is slowing the revolutions: the 0.6-hp motor operates at only 1,680 rpm. But despite that, the recovery time is impressive, as it takes less than a minute to fill the one-gallon storage tank. And the slow motor also contributes to longer life: the pump is designed to have a life cycle before wear of 3,000-plus hours, according to the company. 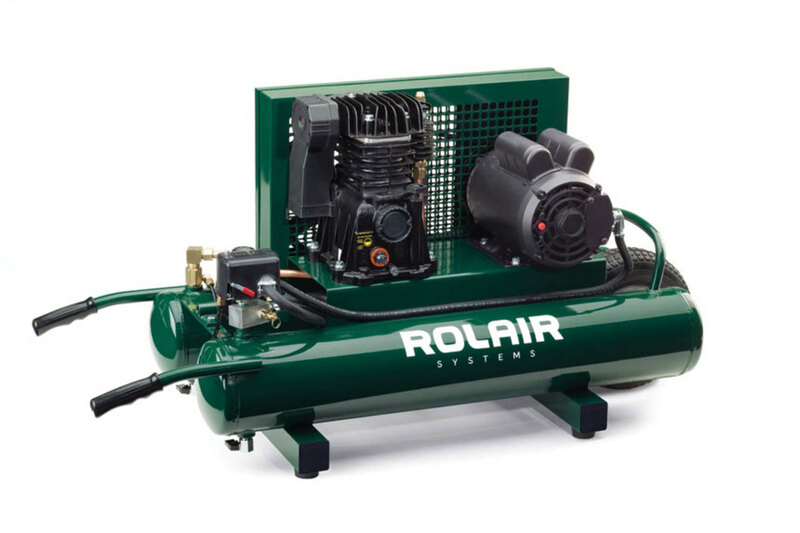 Rolair’s constant speed model 5715MK103 and Mi-T-M’s new 30-gallon diesel compressor (right), model ABS-9KD-30H. 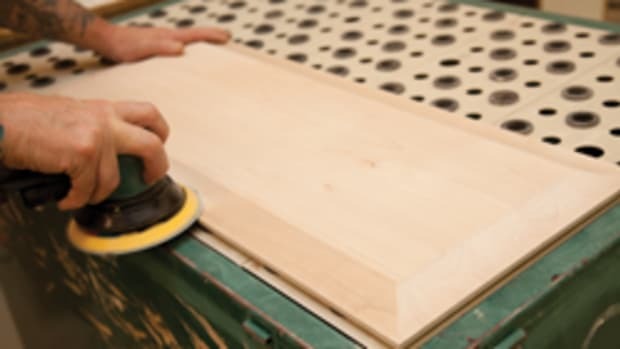 One of the trends in pneumatic resources for larger woodshops is a turnkey solution, where compressed air is now being treated as a standard utility like water, electricity or natural gas. Companies such as Air Technologies in Columbus, Ohio, are installing solutions that locate, build, manage, monitor and maintain a state-of-the-art modular compressed air facility that is located adjacent to the woodshop. The service, which Air Technologies (aircompressors.com) calls DirectAir, supplies guaranteed high-quality compressed air and bills the shop for monthly consumption. 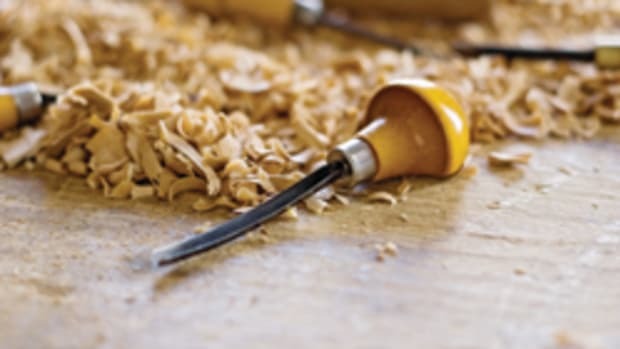 Beyond reliability, the woodshop no longer needs to buy, maintain or repair another air compressor or dryer, and doesn’t need to have employees spend time servicing one. Included in the deal is a 24-hour remote monitoring service to keep compressed air systems at peak operating conditions. All the shop needs to supply is land and utility hook-ups. A DirectAir modular compressed air facility, available from Air Technologies. Ingersoll Rand Air Solutions Group (ingersollrandproducts.com) offers a complete range of services in compressed air system installation and integration, from the smallest air-cooled reciprocating air system to the largest water-cooled centrifugal installation. 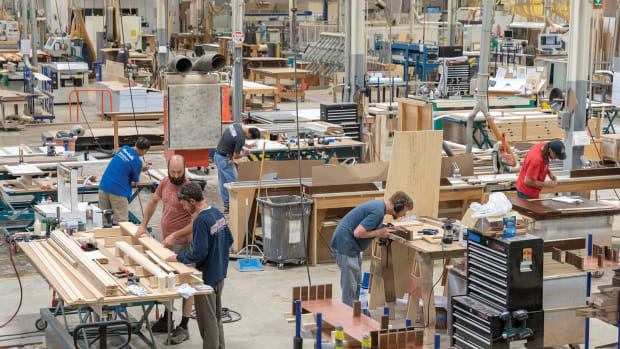 An alternative solution is for the woodshop to own its own on-site, utility-grade supply of compressed air, and a new solution from Milwaukee-based Champion Pneumatic (gardnerdenver.com) does just that. In early 2017, the company introduced its CA-Series ES, which is a fully enclosed, oil-less, rotary scroll compressor system. These are fixed-speed, single-stage units from 5-10 hp (per pump), and they are packaged in a sound attenuating enclosure. If your shop needs a high level of compressed air and the utility grid isn’t overly reliable, take a look at the new diesel 30-gallon air compressor from Mi-T-M (mitm.com). Model ABS-9KD-30H provides the high capacity airflow required for spraying. It is also two machines in one, with the ability to supply both electrical power and compressed air. The Turanair, available from Komptec Air Systems. Unlike the typical start/stop configuration that is standard among most electric air compressors, constant speed models such as Rolair’s entry-level 5715MK103 will continue to run after the top pressure setting is reached. All excess air that is compressed by the pump is released to atmosphere. CSO’s biggest benefit is that it promotes long motor life. Induction motors prefer to run all the time, rather than stop and start, because that way they can maintain a constant and optimal temperature. That limits the chances of running hot, or even overheating, which is a challenge when the motor is constantly being asked to cycle for brief periods. A disadvantage, of course, is the noise, and there’s also a minimal concern about the cost of electric power. But CSO is easier on wiring and cords, too. 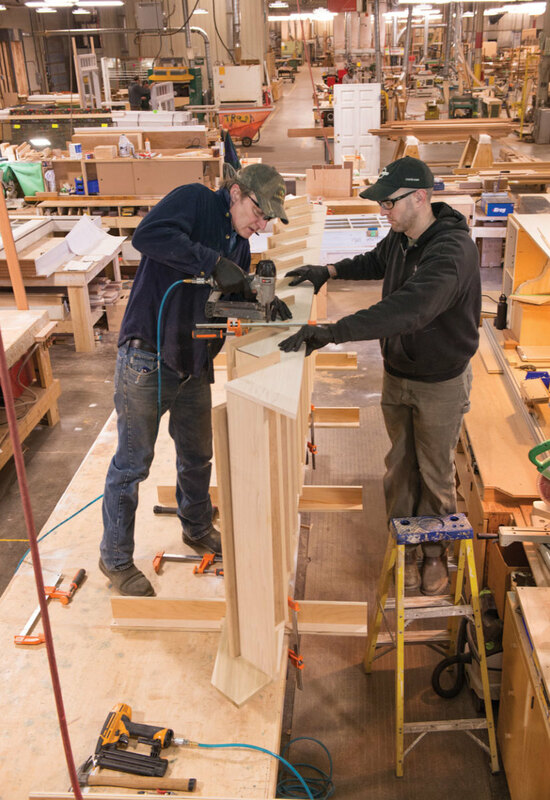 Obviously, constant speed is a better choice for crews working together with high air demands than it is for a single craftsman working alone. But a single machine can handle both of those situations because some of Rolair’s models come with dual controls where the woodworker can switch between start/stop mode and constant speed mode. 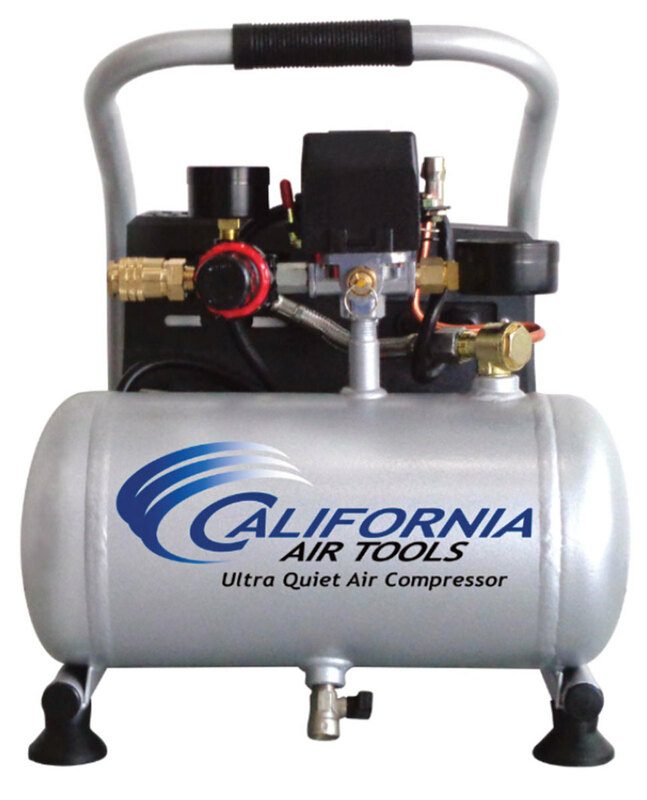 The Light & Quiet compressor from California Air Tools. 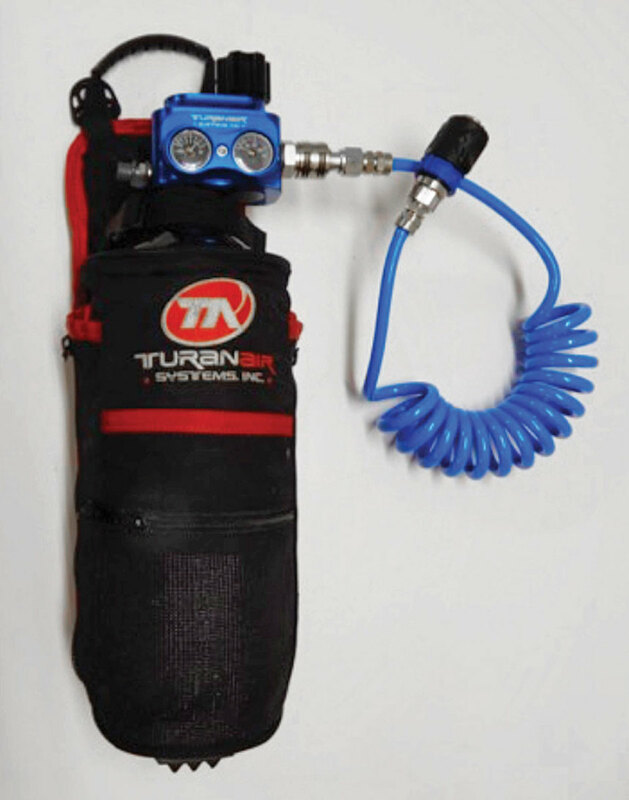 The growth of touch screens, apps and other software is a visible trend in pneumatic tools. Take, for example, the Binks GEMS. 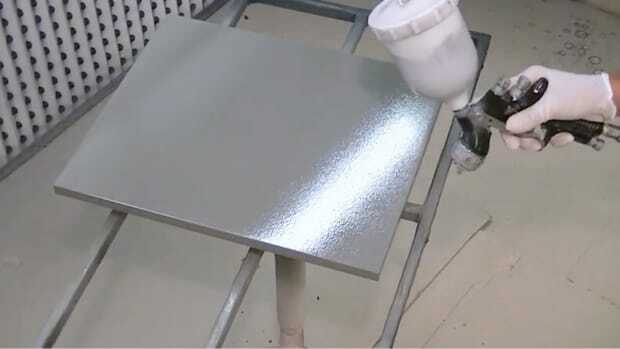 It is designed to make mixing colors easier and incredibly accurate, which is essential in this day of paint-grade casework and the need to match color coatings exactly. 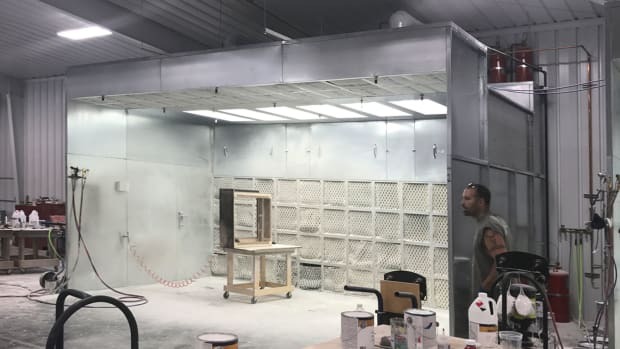 The unit hangs on a wall and audits your paint resin and solvent usage, while helping to reduce solvent waste for up to five colors and two spray guns. But what makes GEMS state-of-the-art is a 7” touchscreen with readily identifiable icons that provide real time information such as flow rate, pot life, current mix ratio and current color. The onscreen help is designed to assist operators with fault troubleshooting, rather than just providing meaningless alarm codes. 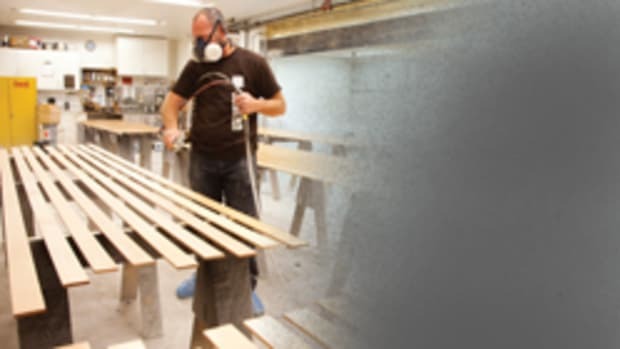 Plus, its data capture capabilities can provide insights into a woodshop’s daily spraying process and audit usage. It’s capable of storing data for individual jobs, recording spraying times and retaining color change information. Binks parent company, Carlisle Fluid Technologies (carlisleft.com) is based in Scottsdale, Ariz., and is also home to the DeVilbiss, Ranburg, MS and BGK brands. 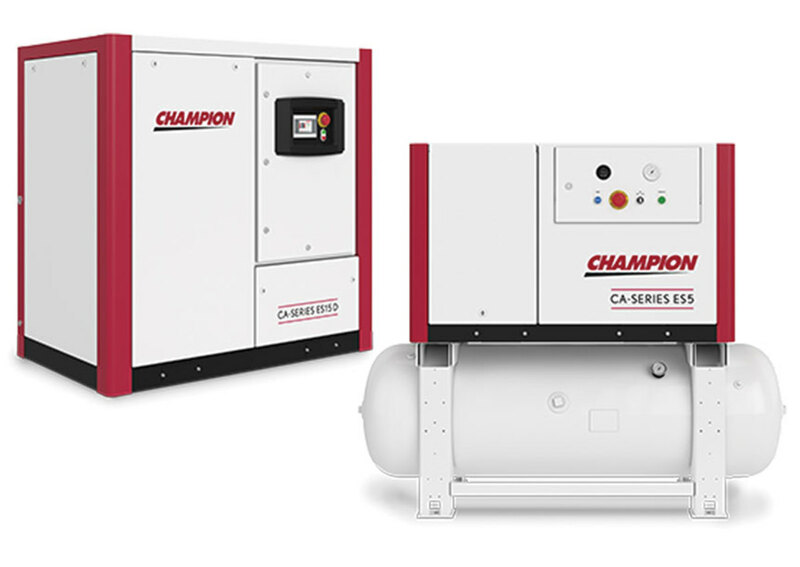 Champion Pneumatic offers fully-enclosed, oil-less, rotary scroll compressors. By the way, shops that are looking at purchasing a new compressor or compressor-generator combo might find a page on the Jenny Products’ website (jennyproductsinc.com) useful. It is aptly named “How to choose the right air compressor,” and briefly covers all the basics from single- and two-stage pumps to terminology, electric and gas power, horsepower, tank sizes and so on. There’s also great information on the differences between reciprocating, rotary screw and rotary centrifugal air compressors on the Engineering Toolbox website (engineeringtoolbox.com). And Quincy Compressor has an extensive library of info on most aspects of pneumatics at quincycompressor.com.